From paddling to swimming to hiking, the physical demands of a river trip can awaken muscles and joints we’ve forgotten we have, particularly in our upper bodies. Luckily, river trips also include leisure time, relaxation and beautiful views – a great combination for giving your body the care it needs. Dorrie Haymon, former OARS. Idaho guide, is a certified yoga instructor. She understands the unique ways that boater bodies work and how to treat associated aches and pains with a combination of stretching, breath and awareness. Below are some of Dorrie’s recommendation’s for a resilient, river-ready body. As with any physical activity it’s important to listen to your body and avoid over stretching, further injury or pushing your body beyond it’s limits. The motion of rowing or paddling over extended periods of time can sometimes cause the shoulders to draw forward, causing a collapse in the front of the chest. Long days of rowing or paddling can lead to our chest, or ‘heart center,’ being closed and caved in. As such, heart-opening stretches are excellent for river folks! Stand, and allow your shoulders to fall down your back. Allow the spine to lengthen all the way from the tailbone to the crown of the head. Engage your abdomen by inhaling to expand, and exhaling to contract. Be sure to engage your core muscles- as this protects the lower spine in heart opening poses. An excellent way to take care of shoulders that engage in repetitive movements (like paddling) is to practice moving and strengthening in different ways. From your cozy sleeping bag practice rolling your shoulders in forward and backward circles. Your arms can remain down- just focus on gently awakening the shoulder joint. When we are pushing our body physically, we have two options: we can dump the impact into our joints, or into our core. Many of us go through life without engaging our core very much at all. Our bodies will compensate by building strong muscles in the arms, shoulders, and legs, which is just fine, however it puts a lot of pressure on your extremities, rather than drawing upon one of the potentially most powerful muscle centers of the body, the core. Practice inflating your entire core as you inhale. You can think of a mountain lion resting in a tree- as they breathe, you can see their entire torso rise and fall. As you exhale, allow the chest to fall, and contract the muscles of the lower abdomen. You might also sense how the tailbone wants to drop and curl in as you exaggerate this exhale. At the bottom of your exhale when you are completely empty of air, draw the belly button to the spine. You can practice leg lifts in a repetitive motion, or you can explore with simply moving your legs in circles. This will ignite the core, as well as open the hips in ways that rowing limits during the day. If you make it a goal to start each morning on the river engaging your core, you will be more likely to draw upon it when you really need it during physical activity. 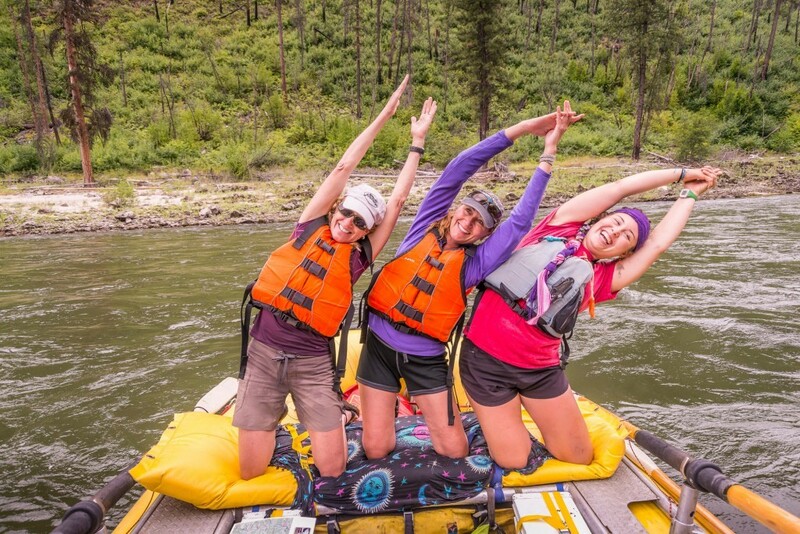 What stretches, yoga poses, breathing exercises or other body work do you use to keep your body healthy during adventure travel and river trips? Share your expertise below in the comments!